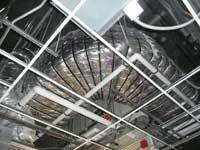 Will Current Grease Duct Enclosure Systems Pass the Test in 2009? Traditional building codes only allowed limited options for fire-resistant grease duct enclosure systems in commercial kitchens, and almost all required some type of rigid board material. Alternative grease duct enclosure systems, such as fire-resistant flexible wrap materials, have gained significant acceptance over the past 20 years for use in exhaust ducts. The design community is recognizing the design flexibility achieved with these newer, zero-clearance enclosure systems while the contractor community is recognizing the cost-effective installation options available. Finally, the building code compliance community understands that these alternative flexible wrap enclosure systems are tested to rigorous and specific fire tests, while many traditional rigid materials may have acceptance grandfathered in without full testing. Flexible wrap grease duct enclosure systems should gain even more popularity now that all the major model codes in the United States clearly reference a specific testing standard—American Society for Testing and Materials (ASTM) E 2336—to show compliance. A specific test standard written to evaluate grease duct enclosure systems, ASTM E2336 was first published in 2004 and is now written into Section 506.10.3 of the 2006 International Mechanical Code and the 2008 Edition of National Fire Protection Association (NFPA) 96. This specific building code language mandates that the building construction community recognize the requirements of the new standard for fire-resistant grease duct systems and adapt its design accordingly (see Figure 1). Nationally recognized testing labs (NRTL), such as Underwriters Laboratories (UL) and Intertek Testing Services (ITS), understand that ASTM E2336 is an American National Standards Institute (ANSI)–approved standard specifically written to comprehensively evaluate all fire performance–related aspects of fire-resistive grease duct enclosure applications. These NRTLs also recognize that ASTM E2336 is now required in the major model codes used in the United States and is therefore the standard of choice for future classification and listing support. Additionally, the International Code Council Engineering Service (ICC-ES) recognizes that the major model codes now require testing to ASTM E2336 and will therefore withdraw Legacy Building Code Reports that used the old UL 1978 test standard as basis for approval. To make the transition from UL 1978 tested systems to ASTM E2336 tested systems go as smoothly as possible, UL, ITS, and ICC-ES have coordinated their activities and will all stop supporting systems tested to UL 1978 in January 2009. This makes it imperative that building owners, specifiers, contractors, and building officials all recognize this important change and transition to code-compliant systems on or before January 2009. Grease duct enclosure systems should be evaluated against ASTM E2336 beginning in 2009, regardless of the version of the model code a local jurisdiction is following. Compliance should be shown with either an ICC-ES building code report evaluated against the 2006 International Mechanical Code and ASTM E2336, or with nationally recognized laboratory listings that specifically evaluate all the criteria of ASTM E2336. Systems that are fully compliant are available on the market and can be found listed in the evaluation reports section of the International Code Council Engineering Service website (search for CSI Code 07815). Within minutes, grease duct fires can reach temperatures of 1,600°F (871°C) to 2,000°F (1,093°C)—hot enough to melt aluminum and ignite surrounding combustibles in just seconds. Typical shaft construction, historically built from fire-rated gypsum or calcium silicate board assemblies, has traditionally been specified to contain such an internal fire risk (see Figure 2). 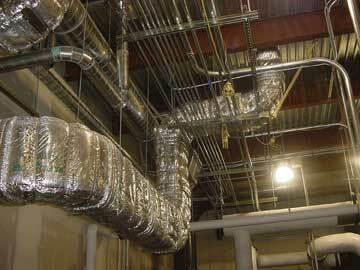 Alternatives to rigid shaft enclosure construction, such as encapsulated, flexible grease duct wraps offering zero clearance to combustibles, have been used extensively since their introduction in the mid-1990s to successfully contain grease duct fires, save precious building space, and save on labor costs. The test standards and acceptance criteria of these flexible enclosure alternatives have, however, been in a constant state of refinement and consolidation over that same period. Fire test standards in general have multiple objectives. First and foremost, fire test standards are designed to approximate expected real-life fire conditions. Actual fire conditions are affected by hundreds of factors, each of which may change the actual behavior of the fire in a real-life situation. Therefore, fire tests are designed to approximate the most likely situation based on all available fire history and input from the building and scientific communities. After the basis of the test is established, a fire test standard must have specific language that provides definitive instructions to the testing lab on how the test is to be conducted, thereby providing consistency between tests and test laboratories. Ultimately, fire test standards are written to evaluate products against expected fire conditions and to provide the design community with affirmation that the products it is specifying are suitable for the application. While grease ducts have been around for a long time, the actual process of writing fire test procedures specific to an expected grease duct fire was first completed with the publication of UL 1978 in 1995. Even then UL 1978 was not specifically a fire test standard, but more of a comprehensive standard for evaluating and listing factory-built grease ducts, of which one component was an internal fire test to determine whether the integrity of the duct could withstand the expected internal temperatures that might be reached if a grease fire were to ignite inside the duct. The first laboratory design listings for grease duct enclosure materials were based on the fire test portions of UL 1978, as it was the best and only available test standard at the time when innovative flexible enclosure materials were first contemplated. Section 4.1 of ASTM E2336 describes a noncombustibility test defined by ASTM E 136. This ensures that the enclosure material does not add significant fuel to a fire during the evaluation period. Section 4.2 of ASTM E2336 describes a fire resistance test of a vertical wall with the enclosure material subjected to the fire conditions defined in ASTM E 119. This is a severe test designed to model a building fire external to the duct and to determine whether the external fire will ignite the combustibles within the duct (see Figure 3). Section 4.3 of ASTM E2336 describes a test defined by a modified ASTM C 518 and designed to ensure the enclosure material does not change over time when subjected to normal elevated temperatures found near operating grease duct exhaust systems. Section 4.4 of ASTM E2336 describes an internal fire test, which requires that an elbow-shaped grease duct with both a horizontal and vertical component be subjected to 4 hours of 500°F temperatures and 30 minutes of 2,000°F temperatures. This is a severe test designed to model a likely fire scenario inside a duct and to establish that materials directly against the enclosure system will not combust. Passing this test gives an enclosure system a Zero Clearance to adjacent combustible construction rating (see Figure 4). Section 4.5 of ASTM E2336 describes a fire test in which an elbow-shaped grease duct with both a horizontal and vertical component is subjected to an external fire engulfment defined by ASTM E119. The integrity and stability of the duct is evaluated after the 1- or 2-hour rating period, and the through penetration of the vertical leg is evaluated against the acceptance criteria of ASTM E814 for through penetration firestops. Sections 4.2, 4.4, and 4.5 of ASTM E2336 include grease duct access doors in the fire testing, since this is deemed to be part of the entire enclosure system. The tests defined by ASTM E2336 are different from the acceptance criteria previously based on UL 1978. In particular, the internal fire test is more specific, more repeatable, and consequently more difficult for enclosure systems to pass. The fire resistance portion of ASTM E2336 (defined in Section 4.2) is a totally new requirement from those previously specified by testing labs. Because these tests are different in significant ways from UL 1978, the flexible wrap type enclosure systems available on the market today that meet all five criteria of ASTM E2336 are all applied in a minimum of two insulation layers. In fact, most of the two-layer systems available today that meet all the requirements of ASTM E2336 are two layers of a thicker, heavier insulation material than that in the previous single-layer system that passed acceptance criteria based on UL 1978. Therefore, it is important that specifiers, contractors, and inspectors not only look for systems that have met all the requirements of ASTM E2336, but also are thinner, lighter, flexible, and have installation advantages. Compliance to ASTM E2336 can be proven with an ICC-ES Building Code Report, which evaluates the enclosure system against the 2006 International Mechanical Code. These reports will list testing per ASTM E2336 in the evidence submitted portion of the test report. An ICC-ES building code report (ESR Report) is an important tool all the way through the construction design, plan approval, building, and inspection process. It gives the architects and engineers all the information required to specify a compliant system without diving into all the specific test details, which sometimes do not translate well into a specification. The design community can simply specify “2-hour, fire-rated duct enclosure system applied directly to the duct with zero clearance from the enclosure material to adjacent combustible construction, tested per ASTM E2336, and installed per the requirements of a valid ICC-ES building code report (ESR report),” and they will get a code-compliant installation that will breeze through plan review and construction inspection. Laboratory design listings can also show compliance but should clearly evaluate the enclosure system against all criteria of ASTM E2336. Sometimes design listings are partial listings because one component of the test standard may be applicable to more than one construction assembly. For example, Section 4.5 of ASTM E2336 is applicable to both air ventilation ducts and grease ducts, so a separate design listing might list “tested per Section 4.5 of ASTM E2336.” On first glance, this might look like compliance to ASTM E2336, but in reality it is only partial compliance to one part of the complete test standard. The United States can boast that it has the safest buildings in the world largely due to the innovation of its construction industry, the consensus process in which codes and standards are developed, and the cooperative efforts of architects and engineers who design to code, contractors who build to code, and code officials who enforce the code. This process has worked again, starting with innovation of grease duct enclosure systems in the early 1990s, acceptance by the building community over the past 20 years, and refinement of testing standards and building codes to adapt to new technologies. This process has culminated into an ANSI-approved consensus standard, ASTM E2336, which is written specifically into the major model building codes in the United States. With these major milestones achieved, previous acceptance criteria will no longer be accepted by the nationally recognized testing laboratories come January 2009, and as such it is important that the building community specify, install, and inspect to ASTM E2336 starting in January 2009. 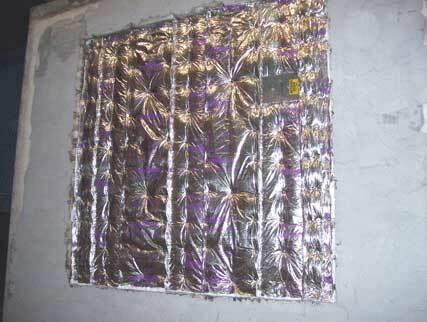 Be sure the grease duct wrap specified in 2009 can pass the test. Traditional versus flexible alternative shaft enclosures. 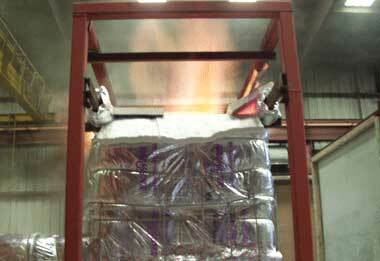 ASTM E 2336: Wall Panel Fire Test.